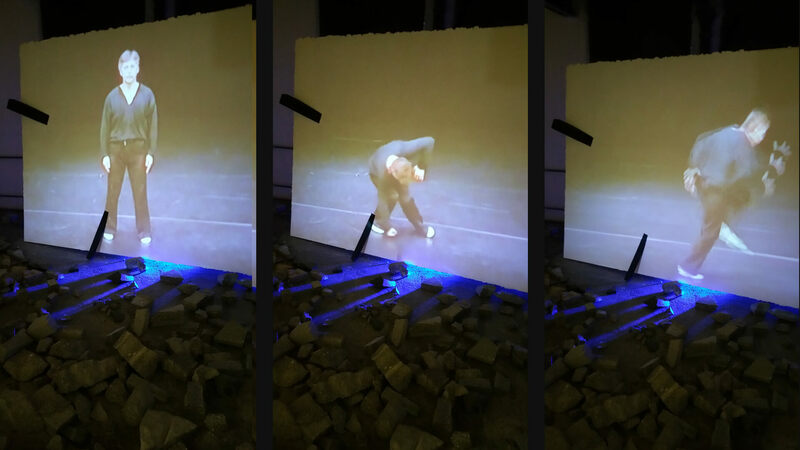 For the exhibition, THE RIGHT TO THE FUTURE at The Museum of Art of the 20th and 21st Century in St. Petersburg, I have conceived a new work which takes as its starting point Meyerhold’s 1, Biomechanic’s2 exercise, Throwing the Stone (exactly 1.32 minutes long). Exploiting theoretical and historical research processes (that have informed this work), I noted that Meyerhold’s revolutionary idea, irrespective of the idealism that accompanied his conception, provokes many searing questions about an individual’s chronicle, lingering between an art revolution and a social revolution. Although Meyerhold embraced the Russian Revolution of 1917, his fiercely individualistic temperament and artistic eccentricity brought reproach and condemnation from Soviet critics. He was accused of mysticism and neglect of Socialist Realism. Meyerhold refused to submit to the constraints of artistic uniformity and defended the artist’s right to experiment. In 1939 he was arrested and imprisoned. Nothing more was heard of Meyerhold in the West until 1958, when his death in 1942 was announced. On February 2, 1940, Meyerhold after being brutally tortured was executed. He was buried in Donskoye cemetery in Moscow, in a mass grave. Departing from Meyerhold’s etude Throwing the Stone -- which we see performed on the large screen by Gennadi Bogdanov -- I aimed to find a connection or a meeting point of this gesture, at once an artistically poetic and art-revolutionary act, to today’s radical acts of throwing stones, acts which range from socially furious encounters, to even claiming to be forms of unarmed resistance. 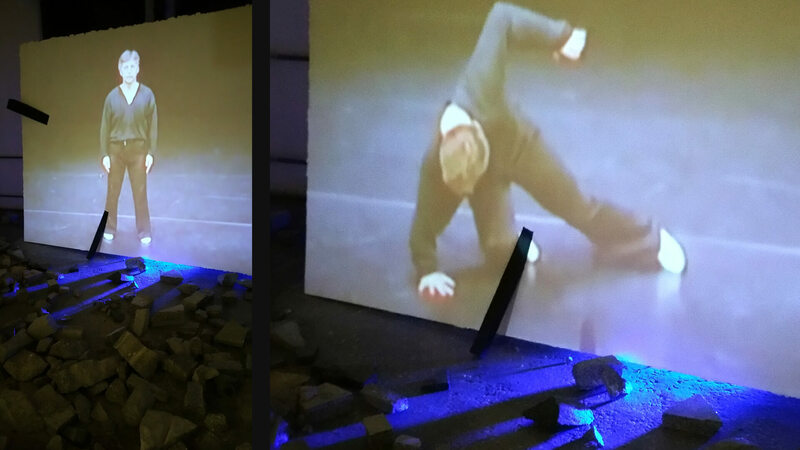 The installation floor is covered with stones, broken pieces of cement and fragmented pieces of marble, implying the existence of a riot or a protest. Stones are thrown in the context of conflict and this act suggests desperation, employed when one has little else for self-defense against hostility or indifference. The sound accompanying the video completes the installation and connects all these elements. 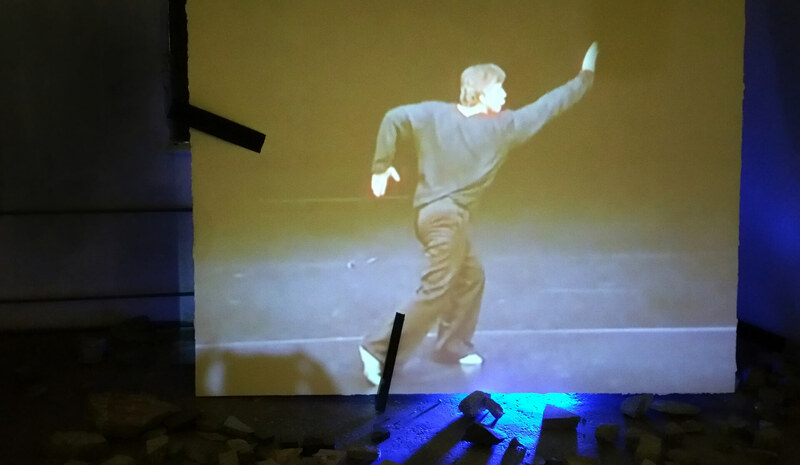 The viewer instead of listening to the melody of classical music normally accompanying such choreographic exercises is found surrounded by echos of riots and stone throwing, taken from actual crisis riots happening in Greece. Some of the desperate voices heard are demanding a “Right to the Future”. In this installation I tried to develop a critical perspective on how we demand and supply social changes as irrational subjects in a world in transition. There is a play between personal and social narratives, between connotations of art revolutions and social revolutions and a play between a troubled past, a critical present and an unforeseeable future. 1 Meyerhold’s anti-illusionary, stylized theatrical practice, one influenced by the political instability of early 20th Century Russia, as well as constructivism and societal mechanization, utilised the physicality of actors as a medium of theatrical expression, rather than traditional dialogue heavy approaches. As we all know, his avant-garde methodology - a contrast to the customary naturalistic theatre of his famed teacher Stalinslavski - was made possible by his theory of biomechanics.